This project provides new on-campus housing for 1,088 undergraduate students. The buildings are on two sites along 6th Street; one at Tyndall Avenue (Arbol de la Vida), and one at Highland Avenue (Likins Hall). Iconic, local landscape elements informed the design concepts for the Sixth Street Residence Halls: at Arbol de la Vida, the model of a “slot canyon” serves to orient rooms around oblique courtyards, and uses daylight control and a strong north-south building orientation to shade community space from the harsh sun; at Likins, to fit as neighbor to both Wildcat Stadium and the Highland District, the form of the buildings drape between the two along the path of a previously significant urban drainage corridor, replacing it with a landscape expressing the arroyo in a more natural form. Campus brick cladding helps tie the projects into the surrounding context, while special detailing, color, and unique design features gives each building a unique identity. The structures at both sites are both segmented to give the sense of a European neighborhood rather than single, monumental buildings.The interior courtyards have the character of streets and are designed to extend the campus fabric inside each facility, while providing a more textured and special landscape within. From the surrounding streets, each student community is easily identified, and thus each site appears as a collection of buildings. The projects include flared hallways to lend a unique form to both the interior and exterior spaces and entice students to gather together and share ideas. The projects are therefore expressions of the concept of the Greek stoa, or marketplace of ideas. 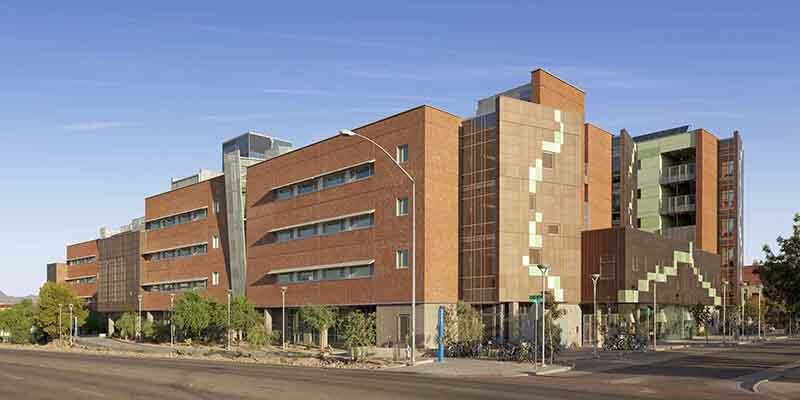 The Sixth Street Residence Halls, Arbol de la Vida and Likins Hall, are the University of Arizona's first residence halls to be LEED registered, and have achieved Platinum certification. The project is located on two separate sites, and provides 1,088 new beds. Land is a limited resource at the University of Arizona campus, so the sites have been developed with an urban approach to land utilization by maximizing building footprint and height. These new on-campus facilities also provide housing in proximity to open space, transportation, food service, academic and university facilities, and nearby businesses. The landscape design uses plant materials that are appropriate for this region, and implements passive water harvesting techniques. Drought tolerant native species are used in the planting areas at the building perimeter, and mezzo-riparian species are used in the shaded courtyards. Passive water harvesting is achieved through site grading, which will slow runoff and augment plant watering, and a deep root watering system will pipe rain water below the soil to supplement the on-site absorption. Additionally, the landscape design implements the use of succulents obtained through a plant rescue and restoration program. To conserve water, low flow shower heads and lavatory faucets, as well as dual flush toilets, are used in the buildings. The landscaping has been designed with regionally appropriate plant species to reduce the amount of water needed for irrigation. The project is a designed with a well-sealed, insulated envelope; strategically located building overhangs and awnings to maximize protection of the windows from the sun; and north-south building orientation. The orientation and awnings reduces heat load on the glass, and therefore reduces energy demand. High performance HVAC and lighting systems are continuously monitored through sophisticated software control algorithms that help optimize their operation and minimize the buildings heating, cooling and electrical energy use. Roof mounted solar thermal panels provide a significant portion of domestic hot water needs. The Sixth Street Residence Halls are connected to the University's main utility network. This network is fed by a series of high efficiency heating, cooling and ice storage systems that utilize sustainable combined heat and power technology to self-generate a significant portion of the campus energy needs. The buildings feature web-based software that can be accessed by students to monitor the amount of energy the building is using. Each student room has a large window providing a generous amount of daylight, and the operable portion of the window will allow for direct ventilation. Materials used in construction are not prone to off-gassing, resulting in a more livable, sustainable environment.